Although the walls of my house are tastefully adorned by paintings, pictures and some Art and though I look upon them with great love and appreciation, I have a confession. Any aspirations to a great soul are dashed when I remember that our first foray into the great Art world, our first original art purchase was prompted by purely philistine motives. I blush to confess it but my husband and I were looking for something to match our upholstery, at that time predominantly beige. I know now that this is a cardinal sin but from this mundane beginning, we acquired one of our favourite, most admired paintings. 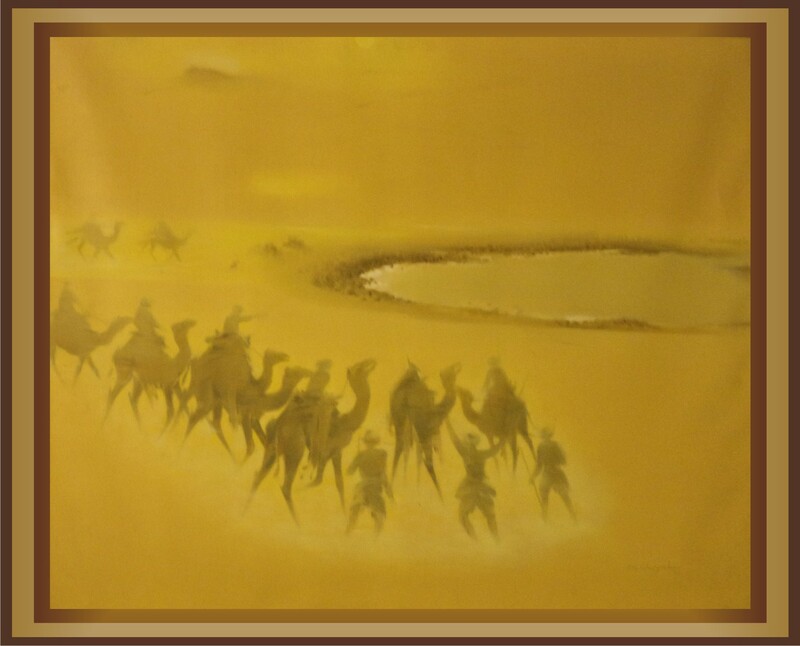 An all beige or rather sand coloured tone on tone study of the desert by Artist P.N. Choyal. It is a scene of an approaching desert storm, the camels in a caravan heading towards an oasis, the water depicted by a darker toned glimmer. Beautiful. In those days our walls were enlivened by the typical art lovers’ prints of Van Gogh and other impressionists. Along the way I befriended an art dealer and became a little more aware of Indian art. I realized that original art need not be too outrageously expensive. I started buying Art guided by two very reliable inputs: my gut and my wallet. As an economist, er….erstwhile student of economics…I am aware of the concept of Real Value and Value in Exchange. So, I only buy Art for love. If I love the painting as much as the other stuff the Money might have bought …if the painting speaks to me, then after I ponder and wonder I may buy it. Unless it is below a certain discretionary price, in which case, I just buy it. As my taste and my bank balance improve, I have been spending a wee bit more or asking for Paintings as my birthday present. 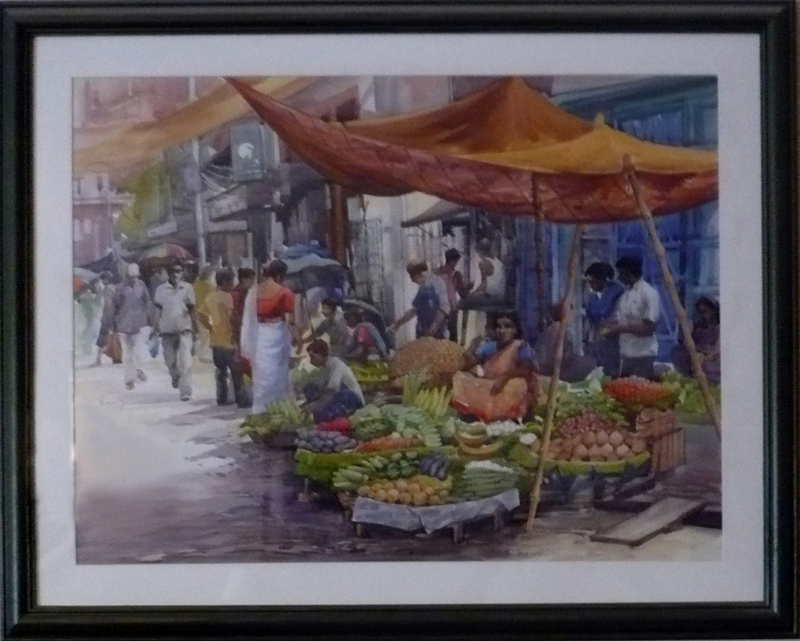 I acquired two beautiful, large paintings, watercolours done by my favourite artist, Aparup Mukherjee. 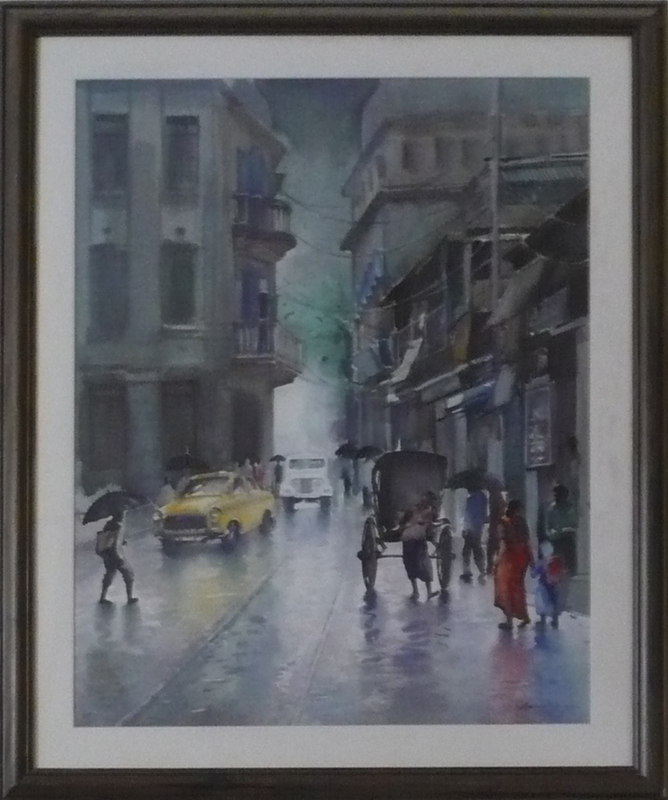 One, a dreamy study in watery blues and grays depicts a rainy Kolkata street and the other shows vegetable vendors with gleaming brinjals, ripe tomatoes, neatly piled greens. The ennui, the everyday mundane reality has been converted to something vibrant and appealing. 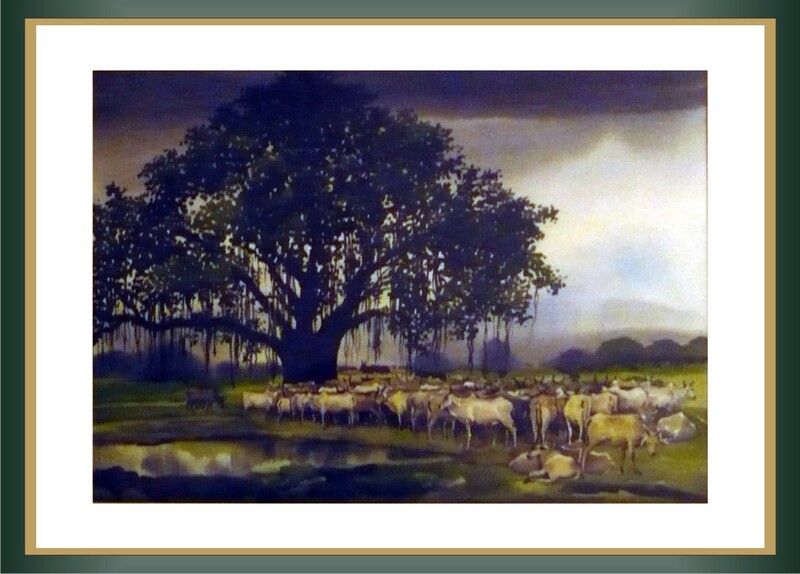 A painting that burst into my heart and said, Buy Me, is one by the same artist of a spreading banyan tree, a herd of cows under the tree, a little pond and an approaching storm. I have named it Pastoral Peace, ignoring the oncoming storm! My latest painting is a beautiful, narrow painting by upcoming and somewhat successful painter Sudipta Karmakar. I first saw this painting at an art exhibition in DLF. I loved it. I wanted it. I waited. Two months went by. My life went on, but the painting would pop up in my mind at times, murmuring seductively, “You want me, you know you want me”. (A conversation I often have with bags, shoes or clothes!) It is now up on my wall and I love to lose myself in its cloudy depths. It is bathed in a rosy glow, so I have named it Godhuli…the hour of dusk when the cows come home and raise the dust and cause this kind of sunset glow. I have two crayon scribbling, actually daubs that I bought many moons ago for the princely sum of four hundred rupees each, which I still dearly love. I have two water colours bought on a holiday in Kathmandu. Though I have become a little more confident in buying Art, I still do not buy Art as an investment. I buy Art for the love of the painting. I love the paintings that I have and I love the way they add joy, colour and depth to our walls. In fact, in our all beige and brown wood bedroom, it is the paintings that lend life and vibrancy. My love for Art has been rewarding and fairly constant. As has been, my love for beige! We are a company formed by enthusiasts & specialists in the art & internet domain. Through IndiaArtVillage.com we have created an online art gallery of paintings from renowned & upcoming Indian artists, and patrons can purchase the same directly from the site. Our collection comprises of more than 1500 paintings from our panel of over 30 artists on a wide variety of mediums & topics - Oil, Water colour, Landscapes, Figurative & Abstracts. Our mission is 'Making Art Accessible' for all - by offering a platform for artists & art lovers to connect, & by offering a wide price range and ease of purchase on our site. This entry was posted in Buying Art, General, General, Home Decor, India Art Village, Indian Art, Watercolours and tagged Art, Art Conservation, Buying Art, Catalogue, cityscape, Colours, India Art Village, Internet, Online Gallery, vegetable market, watercolours. Bookmark the permalink. 9 Responses to Why Buy Art? Reblogged this on Buy Art. Gift Art. Sell Art. .
nice post. your website will be included in my daily reading. I love to buy paintings and to decorate my home wall with such desert type paintings mostly, filled with water colors. The Indian desert paintings are always awesome as I have some art pieces like this beautiful painting. How do i contact you guys if i want to sell my paintings? http://midnighthues.wordpress.com/2013/02/04/window-to-her-soul/ Check out, Minati Nath’s work is featured with my poetry!